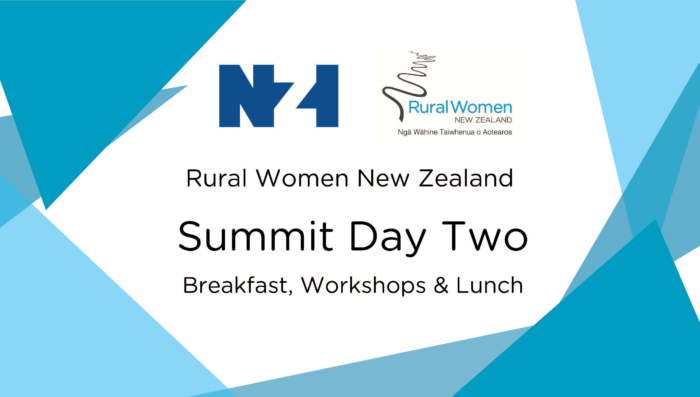 Join Rural Women New Zealand on Day Two of our Summit at the Rydges Wellington, and Old Government Buildings in Wellington for breakfast, constructive policy workshop sessions and lunch with a range of knowledgeable speakers. Breakfast at the Rydges will include guest speaker, Sarah Trotman ONZM who will speak on her leadership experience with a particular focus on being a strong advocate for the advancement of women and girls. Our policy workshops sessions will provide a collaborative space for discussion, building ideas and learning. These workshops are being facilitated by industry experts including KPMG Farm Enterprise Specialist Agri-Food, Julia Jones; Environmental Entrepreneurs, Dr Caitlin Powers & Brian Monahan; RWNZ Board Members, Penny Mudford ONZM and Margaret Pittaway; and TUANZ CEO, Craig Young. The workshops will also include speakers from affiliated organisations and government deparments including the Ministry of Business Innovation and Employment, Horticulture NZ, Age Concern, NZ College of Midwives, P?mu, Landcare Trust, NZI, and more. Download the full list of speakers with their bios here. We invite you to join us at an exciting event to meet and learn from industry leaders and experts in their field. If you own or run a small business or thinking about it, then the NZI Rural Women New Zealand Business Tips Workshop is for you. Designed to support business owners with tips and ideas to make the most out of your business, Rural Women New Zealand has teamed up with NZI, MBIE and Butler Pelvin to bring you this workshop that will take you on the next step in your entrepreneurial journey. You can’t get anywhere in life without taking risk — understanding and managing risk can help you win. How to promote your business and work with customer enquiries on social media. What makes news, how to tell your story and the dos and don’ts of interviews. Your rural business and the law: A how-to guide to being compliant in promoting your business and tips and tricks for entering into contracts. Networking: how to build and leverage your networks to grow your business. Business Resources to make business easier. Why not also take the opportunity to network with the NZI Rural Women New Zealand Business Award winners at our Breakfast of Champions with Guest Speaker Sarah Trotman and Lunch at Rydges with author Kate de Goldi. Read the full programme here. Held at Victoria University Law School, Old Government Buildings. Social: RWNZ National Chair, Penny Mudford will lead discussion on wrap-around support — what does it look like and mean, and how do we do it? With input from MPI Mycoplasma bovis Response Manager, David Wansbrough supported by Liaison, Michelle Taylor; HortNZ Chief Executive, Mike Chapman on PSA recovery, and; Te Puni K?kiri Chief Advisor, Nancy Tuaine speaking on Whanau Ora. Technology: TUANZ CEO, Craig Young will facilitate discussion on the issues and solutions with Crown Infrastructure Partners Chief Executive Officer, Graham Mitchell, WIZWireless founder Bridget Canning, MBIE Senior Policy Advisor, Janelle Whittleston, and MBIE Policy Advisor ReneeDuffell. Julia Jones will facilitate a discussion on factors affecting farming along with input from Rabobank’s Dairy Analyst of their RaboResearch Food and AGribuisness division, Emma Higgins, SME Principle Policy Advisor, Jon Cable and General Manager, Just Transitions, Gus Charteris both of MBIE. International: National President, Fiona Gower will facilitate this workshop with support from Beryl Anderson (former President of the National Council of Women) who has extensive experience in the UN Convention on the Elimination of all forms of Discrimination Against Women (CEDAW), Barbara Bedeschi Lewando of Kiwi Consult, an experienced project practitioner in the Pacific and others. Education: RWNZ will host a discussion on Education for our future with MBIE Future of Work Policy Director, Gerald Minnee, NZ Initiative’s Briar Lipson. Margaret Pittaway will facilitate discussion on rural health issues with the support of NZ College of Midwives CEO Karen Guilliland, Skylight Trust Chief Executive, Heather Henare, and Age Concern Chief Executive, Stephanie Clare. Environment: Dr Caitlin Powers and Brian Monahan will co-facilitate a discussion with Landcare Trust Chief Executive Officer, Dr. Nick Edgar, Interim Climate Change Commission Chair, Dr. David Prentice and Pamu Head of Environment, Alison Dewes.